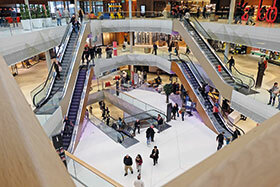 The Mall of Switzerland, located in Ebikon in Lucerne, has a total floor space of 65 000 mN. It is the second largest shopping centre in Switzerland. Visitors to this ultramodern building complex can take advantage of about 90 stores, 18 restaurants, a multiplex cinema with 12 auditoriums, a large indoor playground and multiple exercise facilities. For the Mall of Switzerland, Bosch’s building experts implemented a tailored security solution for controlling access to restricted areas. At its core is the Matrix access control system, which features a combination of electronic cylinders and door fittings, plus readers, terminals, controllers and software. A management system with a customised user interface visualises the states of more than 100 doors to let staff quickly and easily monitor and control them.